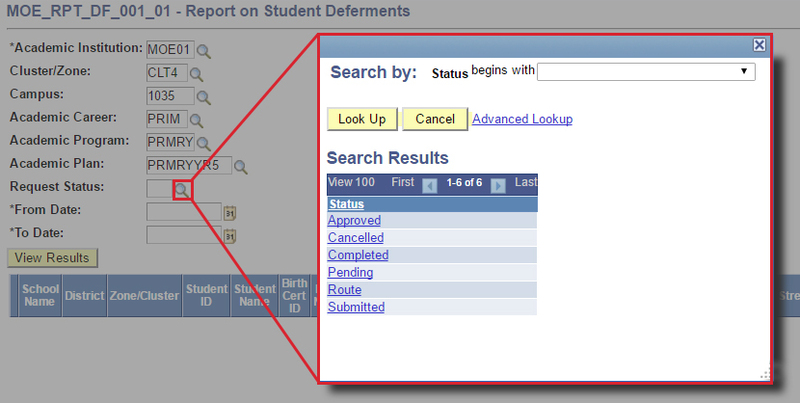 This function allows the users to view the Student Deferment/LOA Request Reports. Select ‘Query Name’ from the dropdown list to Search. Enter ‘MOE_RPT_DF_001_01’ as the *Query Name. The search results will display the query. Click on HTML link to open a web page to enter the input to run the report and the results will be displayed on the web page. Click on Excel link to open a web page to enter the input to run the report and the results will be opened in an Excel worksheet. 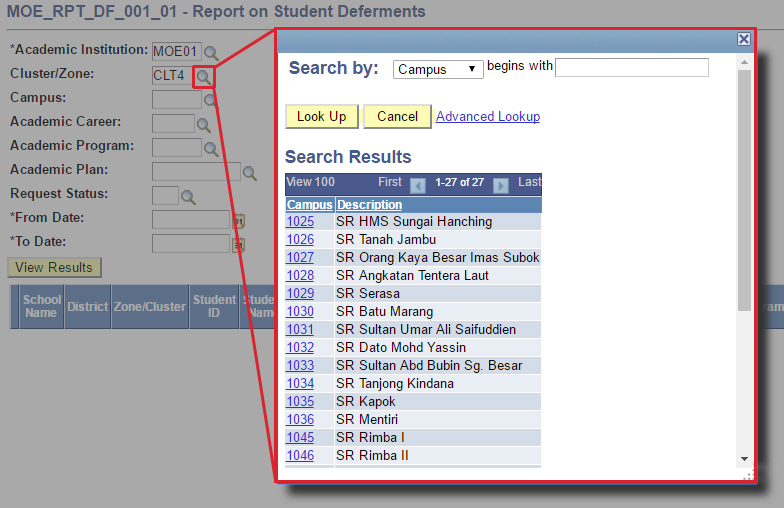 User will be directed to the Detailed Report for Deferment. 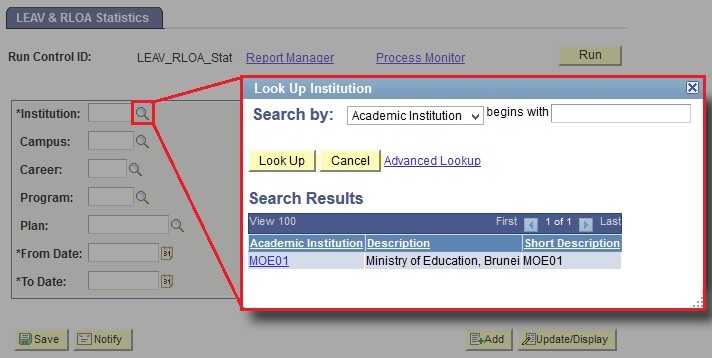 Click on the lookup icon to select the *Academic Institution value. 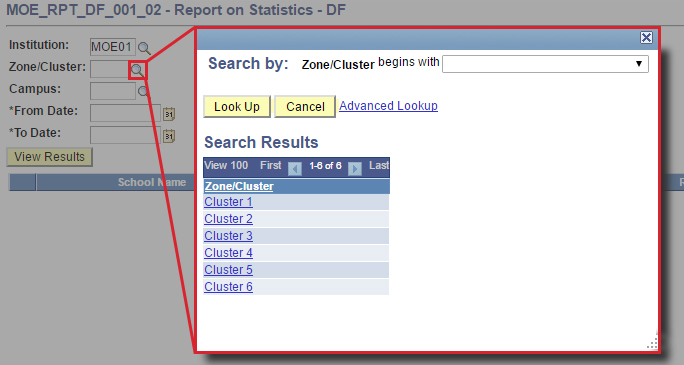 Click on the lookup icon to select the Cluster/Zone value or enter ‘%’ sign to select all the values in the lookup. 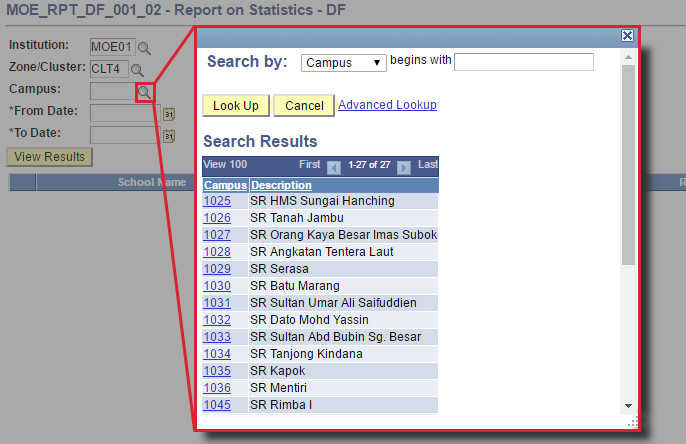 Click on the lookup icon to select the Campus value or enter ‘%’ sign to select all the values in the lookup. 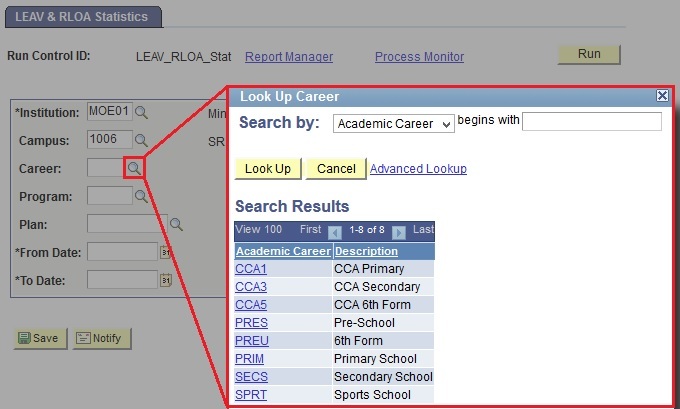 Click on the lookup icon to select the Academic Career value or enter ‘%’ sign to select all the values in the lookup. 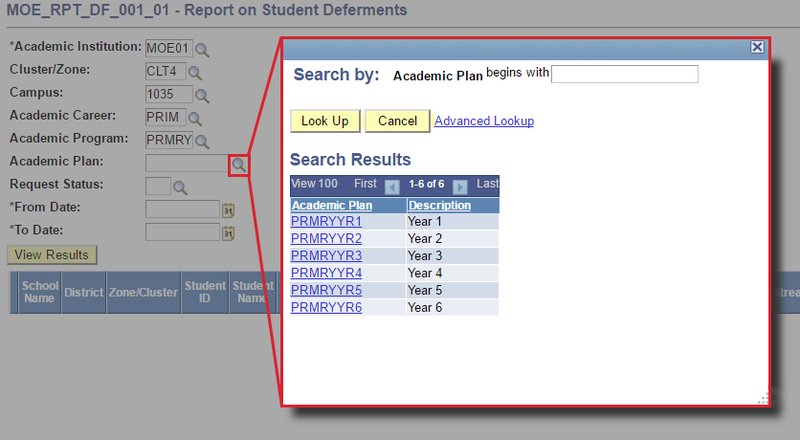 Click on the lookup icon to select the Academic Program value or enter ‘%’ sign to select all the values in the lookup. 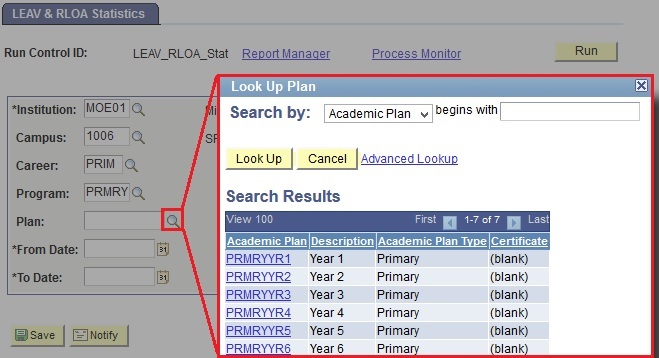 Click on the lookup icon to select the Academic Plan value or enter ‘%’ sign to select all the values in the lookup. 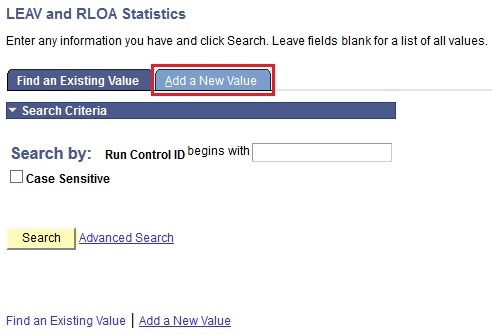 Click on the lookup icon to select the Request Status value or enter ‘%’ sign to select all the values in the lookup. 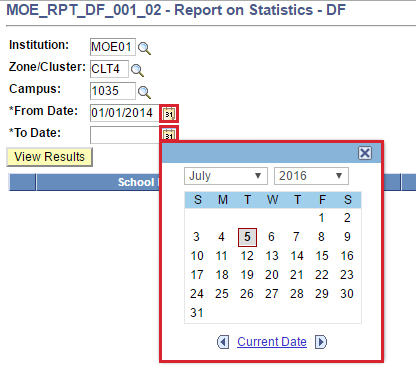 Click on the Calendar icons to select the *From Date and *To Date that is used to indicate the period for which the Report should be run. 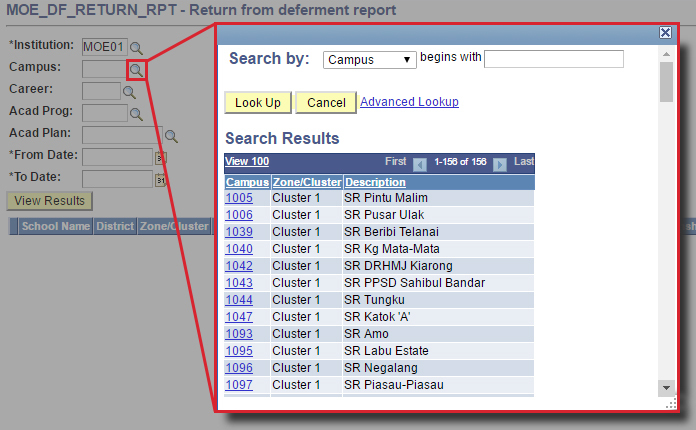 The result will display all the Deferment Requests that were raised during this period. Click on the Excel SpreadSheet link to download the Report Results in an Excel Spreadsheet. 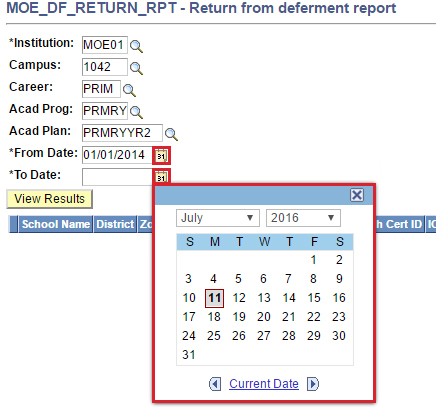 This function allows the users to view the Student Deferment Request Reports. Enter ‘MOE_RPT_DF_001_02’ as the *Query Name. 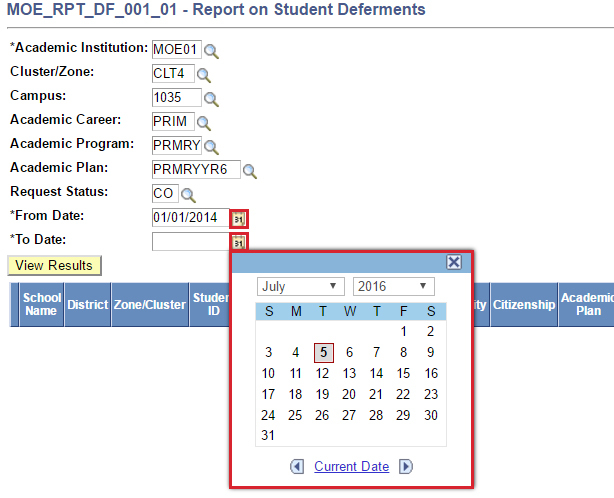 User will be directed to the Statistical Report for Student Deferment. Enter ‘MOE_RPT_DF_RETURN_RPT’ as the *Query Name. 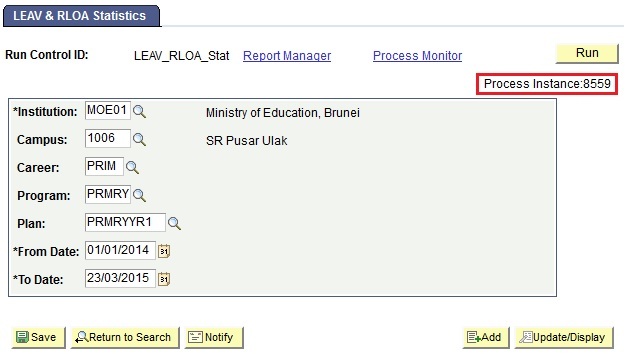 Click on the Calendar icons to select the *From Date and *To Date that is used to indicate the period for which the Report should be run. The Deferment Requests selected will be the ones raised during this period. 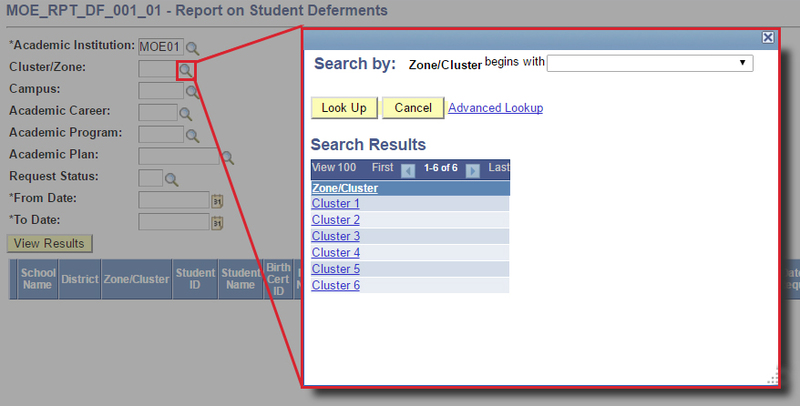 Navigate to Main Menu > Records and Enrollment > Student Movement > Student Deferment > Reports > LEAV and RLOA Statistics. 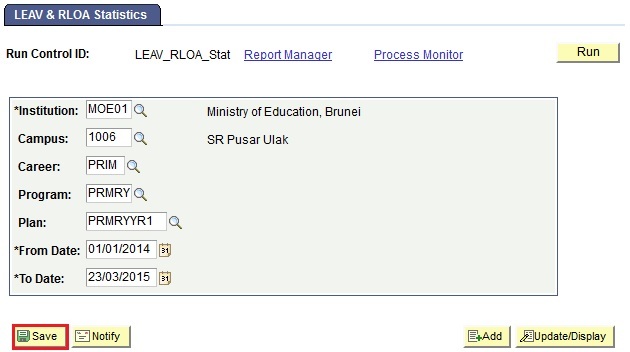 Note: Run Control ID is a unique ID assigned to identify the data entered to run the process to generate the report. The ID cannot contain any spaces, hyphens ‘-’ and underscores ‘_’ between words. 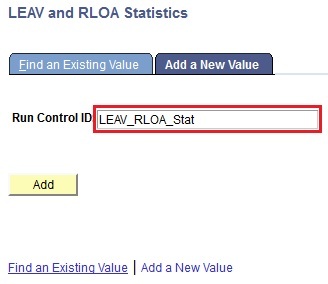 User will be directed to the LEAV and RLOA Statistics page. 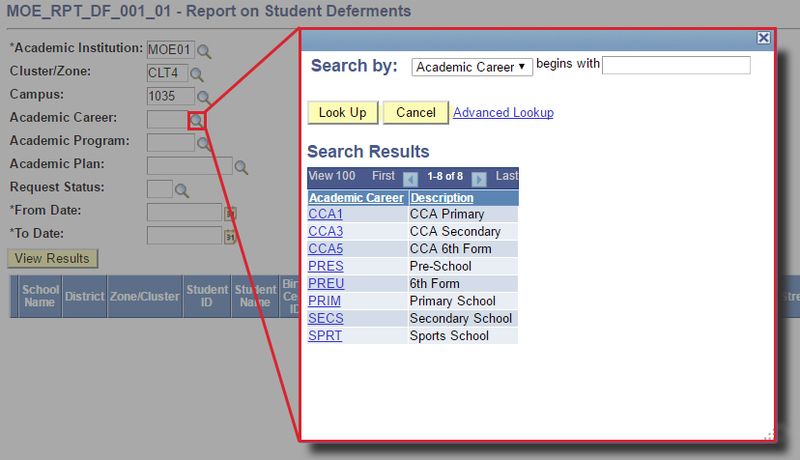 Click on the lookup icon to select the *Institution. 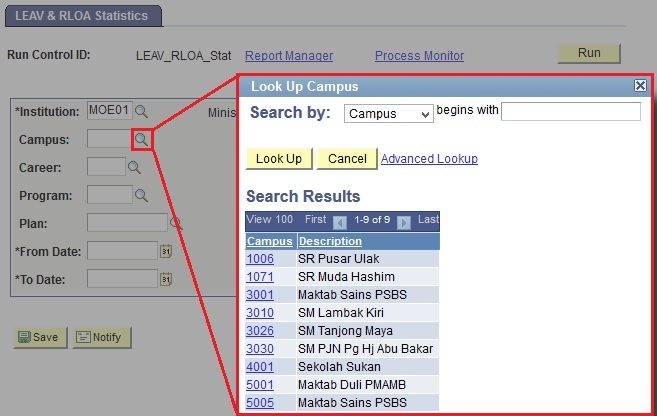 Click on the lookup icon to select the Campus value or leave it blank. 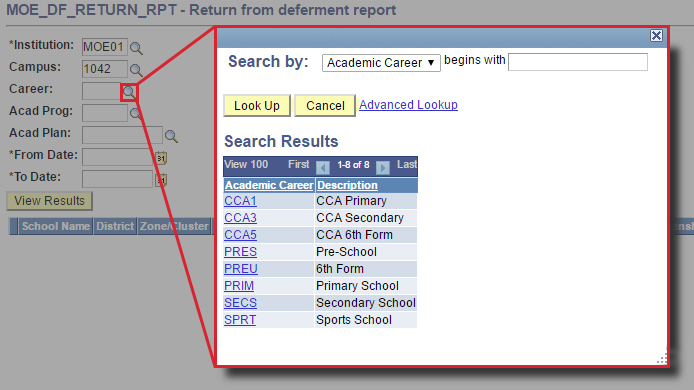 Click on the lookup icon to select the Career value or leave it blank. 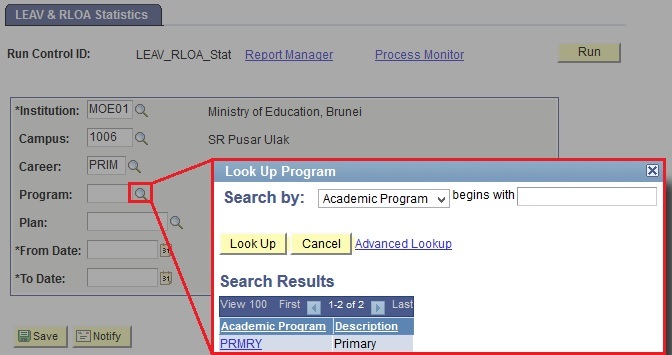 Click on the lookup icon to select the Program value or leave it blank. 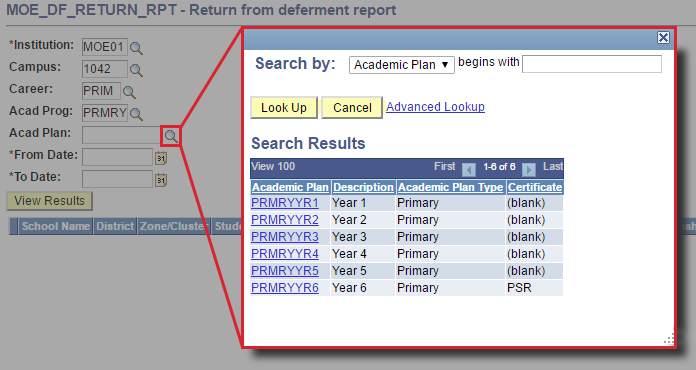 Click on the lookup icon to select the Plan value or leave it blank. 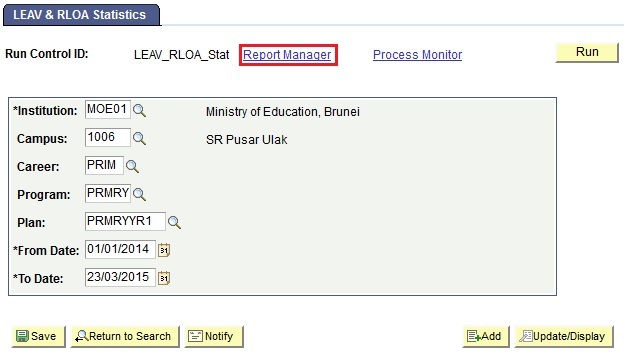 Click on the Calendar icons to select the *From Date and *To Date that are used to indicate the period for which the Report should be run. Click on the Save button to save the process parameters entered. 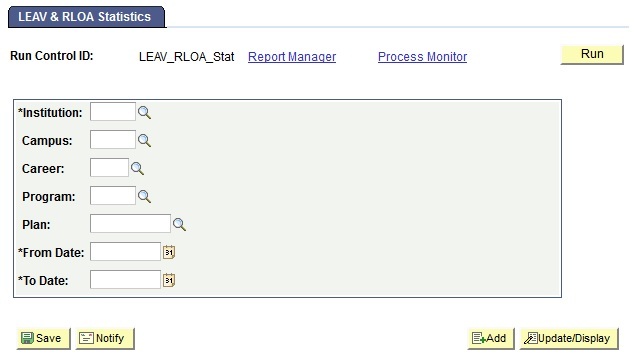 User will be directed to the Process Scheduler Request page. Once the process has begun to run, a Process instance number will be assigned. 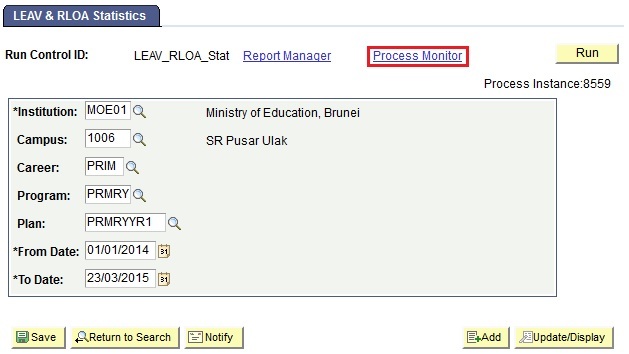 Click on the Process Monitor link to check the status of the process run. Click on the Refresh button to view the refreshed Run Status. Continue to clicking on the Refresh button until the Run Status changes to ‘Success’ and Distribution Status goes to ‘Posted’. 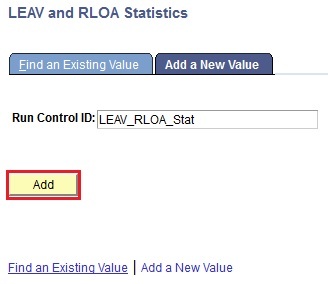 Once the Run Status changes to ‘Success’ and Distribution Status goes to ‘Posted’, click on the Go Back to LEAV and RLOA Statistics link. 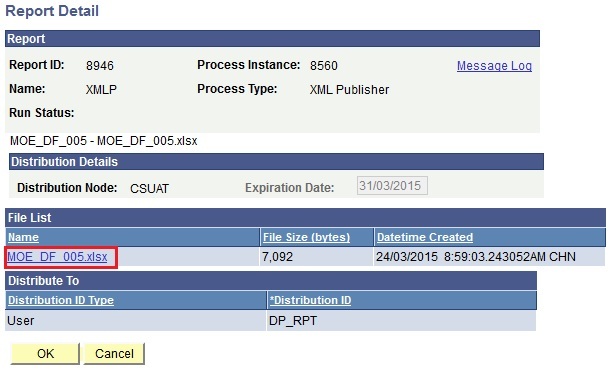 Click on the MOE_DF_005 - MOE_DF_005.xlsx file created against the Prcs Instance of the process which was run to generate the report. Click on the .xlsx (Excel) file created. 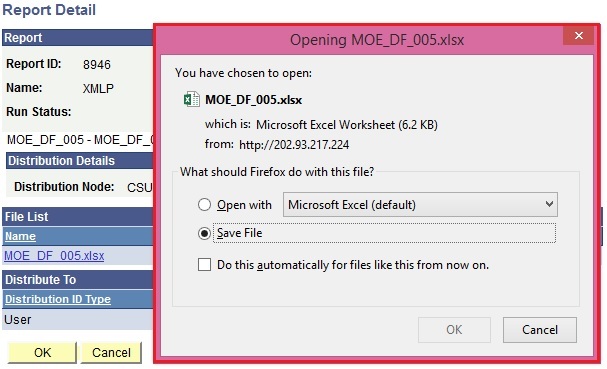 A prompt will be displayed suggesting to the user to either save or open the Excel Spreadsheet to view the generated report. Select the Save option. 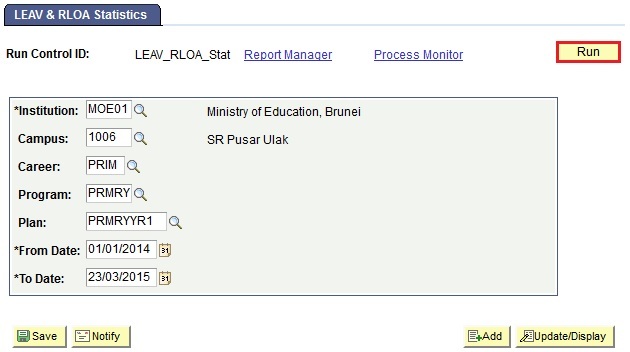 Open the saved Excel Spreadsheet to view the LEAV and RLOA Statistics.